We have worked very hard in putting together our program and we happily refer to exemplary breeders. 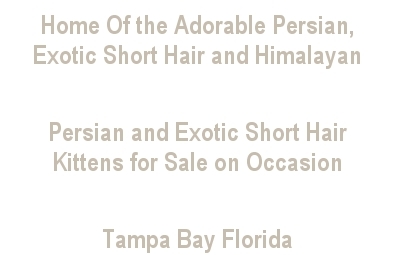 We are not a cookie cutter cattery staunchly supporting one Registry organization over another but rather true lovers of beautiful gentically healthy Persians and Exotics. Registering with other organizations is extremely expensive but we are getting there and we feel it is important to fellowship with as many experienced people as you can to continue your growth and knowledge. We have chosen our foundation cats for the type and features they can bring to us, not for thier pedigrees and bragging rights. Our foundation cats have both Very Modest and Top of the Line Lineage. 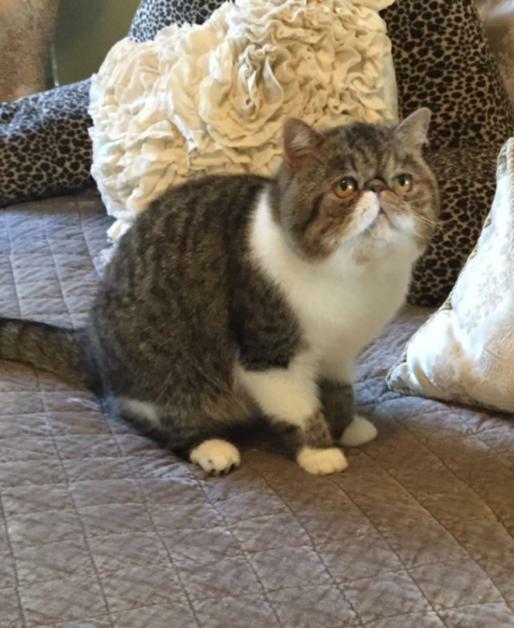 Breeding for show is an all consuming quest for the perfect kitty. 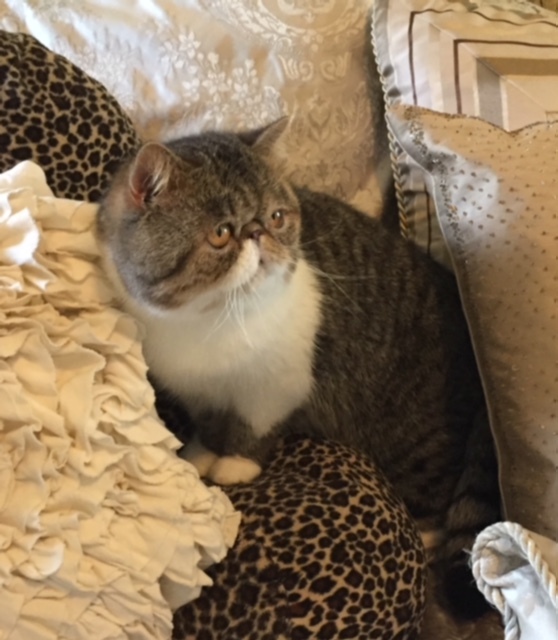 What a neat ride however very time consuming, Expensive and addictive :) Belcherpurrs loves to pieces and owns fully all cats shown on this site. We breed for our own pleasure, to SHOW standard as is the fun of this hobby. Those who know us know that we are reputable and clearly above board with the health and care given our kittys. Given a choice we prefer warm stable families for our kittens. I can count on one hand the number of kittens we have allowed to Breeding Catteries. When the time comes when we do not have 3 kids in 3 different schools and we accomplish our goals we will participate more in showing. Stay away from the gossips. Lift someone up. Be friendly and caring to those who come to you for advise once your feet are wet. Share your experiences so others may have it just a little easier. Never have more than 5 or 6 cats to take care of as it will be overwhelming when the kittens come and heart breaking when you just cannot get to thier care. We see it over and over. Learning to do what we do is a long road and one paved with huge heart break and massive financial losses. Lets share....new people will eventually have your offspring if not by you, by someone else....lets help them with the knowledge to take care of our babies. Honesty is always the best policy when starting your own program. We will not knowingly sell to someone who is an unregistered cattery with little or no experience and without the financial backing to care for these babies. This is an expensive hobby. Patience will save you heart ache and a whole lot of money. At best your cattery will be a savings account and will never make you rich. At the end of the day you are neither up or down....just a little worn. Being a Part of The cat Fancy is like living in a Small southern Town. We all know each other or of each other so please remember this when the temptation of spreading gossip is hard to resist. Please be true to yourself and be sure you are willing to spend the time and money needed to begin this journey. Fellowship with those who will share. Once you have your cats they are yours to care for good or bad. They are not ornaments you can sit on a shelf when you are ready to spend time. They are sweet little animals who are at your mercy. Please Take care of them. Happily Residing with My Long time Friend Dee and her family. Thank you Dee! Ragnar has the qualities I love in a thick plushy coat, wide smooth top head, gorgeous eye color and ears on the smaller side. His current weight is 11lbs 13 oz. Due to personal circumstances he has yet to be shown but is very deserving. LT *Lelija Fahrenheit Of Belcherpurrs " HOTTIE "
I am very excited to have this adorable young man join our family. He has the sweetest eyes, fat little body and is soooo short in the leg and back. Thank you a million times over Sharon! !